I’m talking about drinking my favorite mulled wine while watching the snow fall outside, listening to some cheesy Christmas songs, picking out the family tree, and choosing different types of Christmas lights. At home, my dad has always been the most competent one on what types of Christmas lights to display. Which types of Christmas lights would fit best my design requirements? 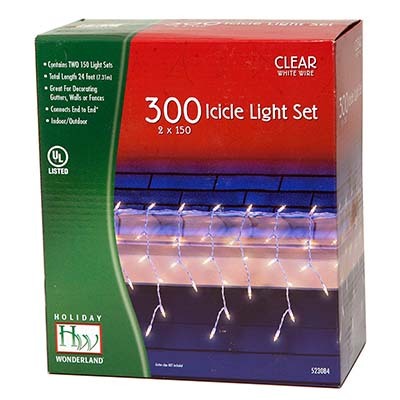 Do I need both incandescent and LED Christmas lights? 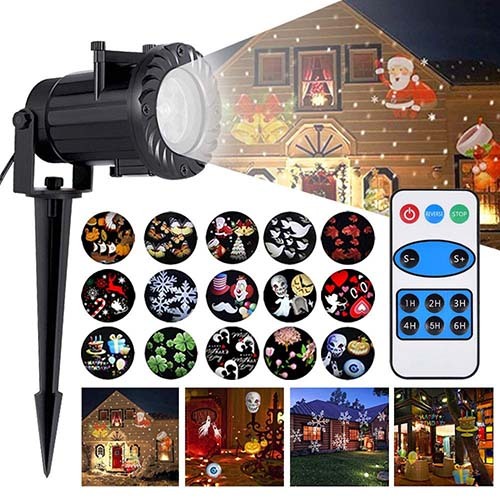 Which types of outdoor Christmas lights do I want? What are my electric energy consumption requirements? 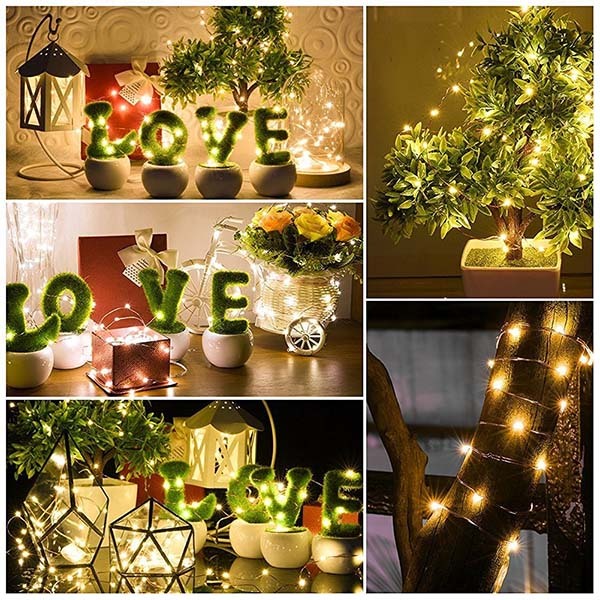 However these two types of string lights are being offered in a huge variety of bulb shapes and colors, I think it’s important to distinguish the key differences between them as well as their pros and cons. No matter which one you choose they can make your home a magical one! When speaking of Christmas bulbs size, there is just so much “industry language” that can easily confuse even the most experienced Xmas shoppers. Let me help you clear the clouds! When choosing the types of Christmas lights bulb, keep in mind there are the figures written on the box, for instance, C7 (E12 Candelabra base)and C9 (E17 Intermediate base) indicate the diameters of the bulbs which simply means that C9 LED or Incandescent bulbs are larger than C7 bulbs. 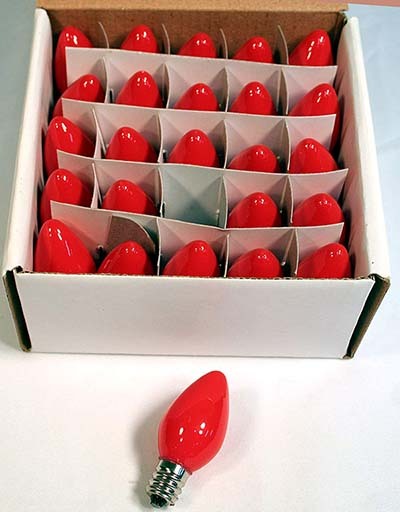 G50 Incandescent bulbs have a round shape and the 50 is their diameter in millimeters which is 1.7/8 inches. 💡 Hint: The most suitable types of Christmas lights decoration are C7 LED or Incandescent bulbs (great for smaller outdoor festive trees, night lights, electric candles, and to line walkways and rooflines); C9 LED or Incandescent bulbs (ideal for larger outdoor Xmas trees and to line walkways and rooflines); G50 Incandescent bulbs (perfectly fit outdoor Christmas party decorations, smaller trees, bushes, patio); and S14 / T50LED or Incandescent bulbs (outdoor decoration for parties and patios). ➡ Take a look at the table below to get familiar with the other bulb sizes. These are the classic old-fashioned Christmas light strings that perhaps your parents and grandparents used to have as well. 🙂 They have a nice, warm, sparkling glow. Plus, they are usually multicolored and will give your X-mas tree a timeless look! Note: Keep in mind they are not energy efficient. 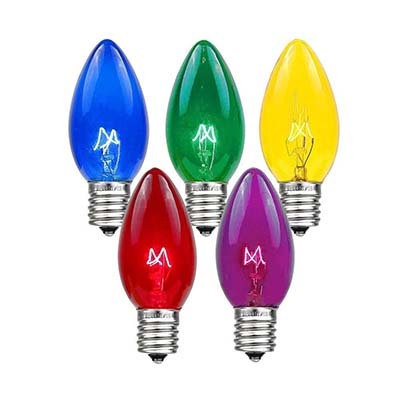 Speaking of different types of LED Christmas lights, these ones are perhaps the most common ones. 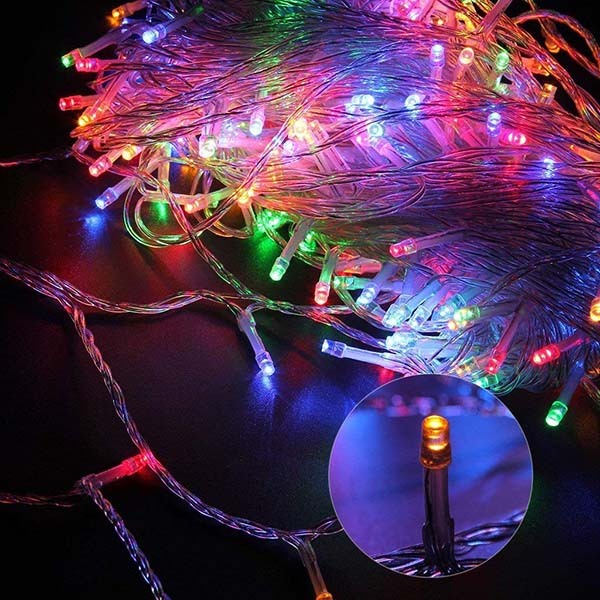 When comparing all types of indoor Christmas lights, these ones are perhaps the most durable and energy efficient ones. They are also able to blend into our tree better thanks to their smaller size. 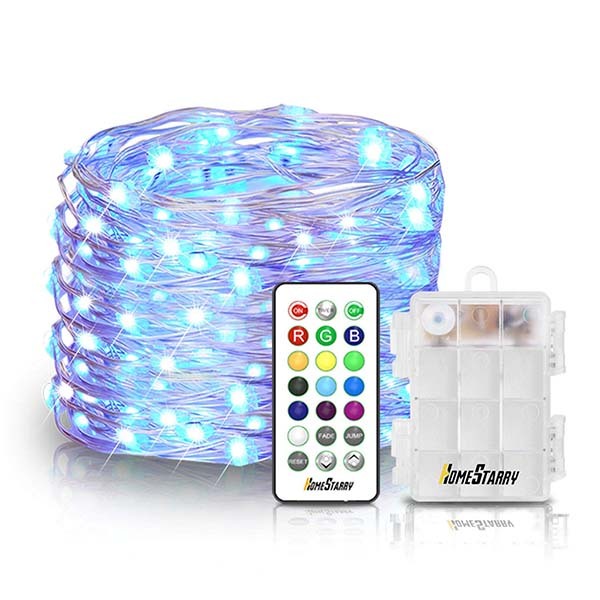 Moreover, every string also is full-wave rectified which eliminates any fulgurating while making these LEDs shinier than the regular half-wave wide angle LED mini lights. Note: Keep in mind they are quite pricier compared to the traditional incandescent string lights. 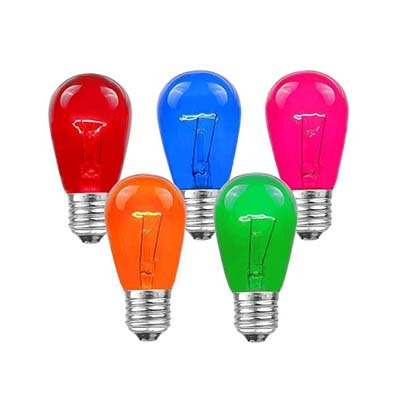 The large bulb lights, also known as C5, C7, C9, and G40, surely make a strong statement and give the house a retro vibe. Compared to all types of Christmas lights, these ones are the most suitable for hanging house lights. Note: Do not forget to measure before deciding how many strings of large bulb lights to use. Note: Keep in mind they can grow hot and the threat of fire is much larger. Net lights are already fixed together into forms, making it easy to get a uniform look when you enwrap them across shrubbery or structures. Want to give your home an eccentric snow-covered appearance? Then consider buying the icicle lights. They are good if you want to decorate your front porch for Christmas. 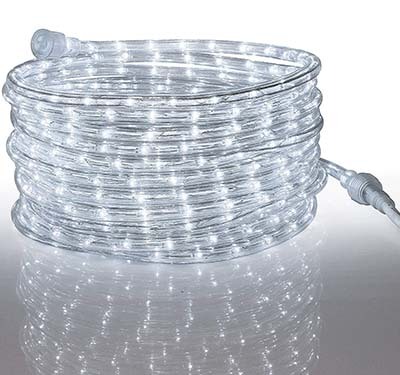 The LED rope lights are one of the new types of Christmas lights. They are ideal for creating labyrinthine shapes and designs in the walkway, doorway, and windows. LED projection spotlights are the most time-saving option as they do not require any installation. Just plug them into an electrical outlet and point them anywhere. You can project Christmas images over the wall or nearby trees. Raindrop LED Christmas lights – you have seen them lately at malls and other commercial centers. They look fantastic, they are easy to install and can add originality to your home. As they are waterproof, you can install them on a tree or the end of the roof. 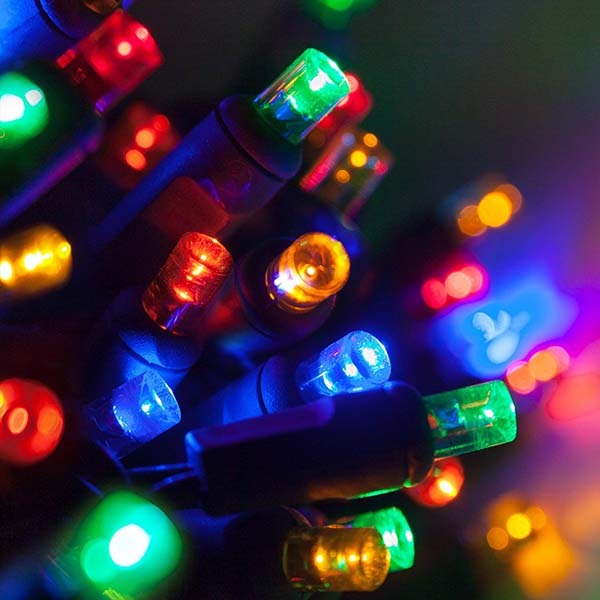 Whether you decide to stand by traditions or follow the latest trends, here are the three main types of Christmas lights according to the power supply. Battery operated lights allow you to place lights any place you wish regardless of whether there’s an electrical outlet nearby. They are ideal for door decorations, wreath, roofline, shrubs, mantel decorations, centerpieces, staircases, and window swags. If we should compare all types of Christmas lights offered on the market, those ones are the most energy inefficient. However, they are giving the traditional Christmas-y warm light look. These ones are very energy efficient, waterproof and offer up to eight hours of use on a charge. However, if you are using them indoors, plan carefully how you’ll provide an access to direct sunlight. Their biggest disadvantage is the fact they are only offering cold LED coloring. How many strings of Christmas lights will I need to cover the area? The answer is only one – that’s totally up to you! 😉 There is an old helpful rule of thumb – 100 lights for every foot-and-a-half of the indoor tree. Of course, if you are a big fan of the heavy Christmas lighting, you might want to double or even triple that amount. The thinner trees will need the fewest number of lights. Consider using large bulbs size for trees such as trees like pines, firs, and spruces. By wrapping bushes and shrubs with net or icicle lights, you will be able to cover a greater area with fewer strands and less work. 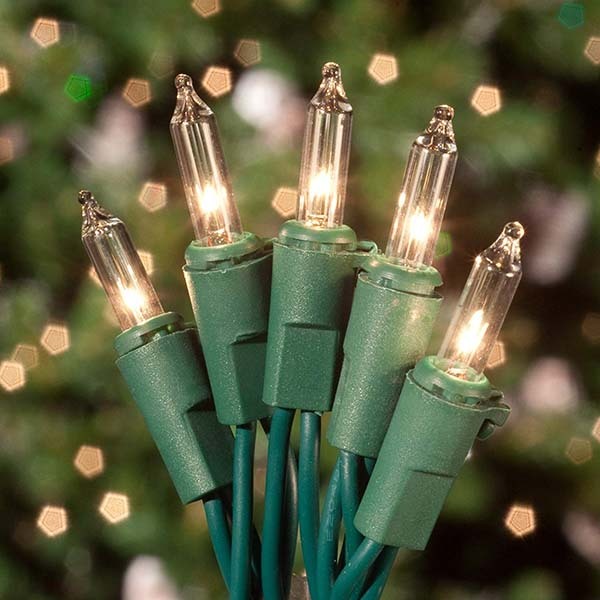 When covering up tree branches, consider using lights with 6-8 inches of spacing between the bulbs. 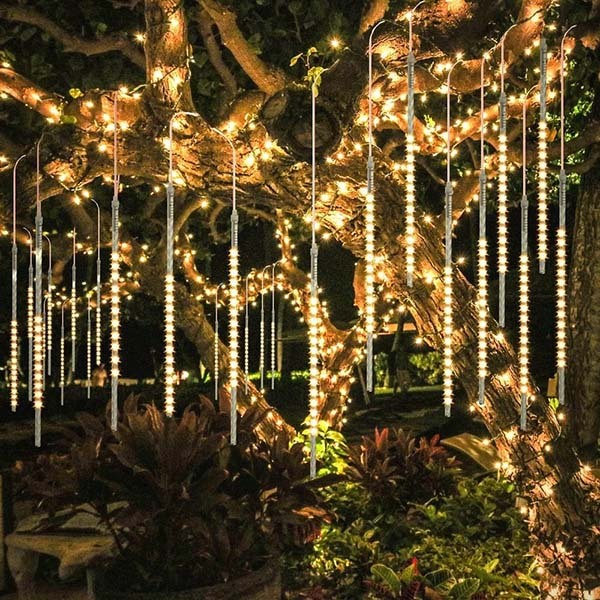 The white Christmas lights give your decoration a timeless look, while the colored lights are more fun and cheery — plus, you can easily coordinate them to create intricate designs. Not all white LED lights have an identical tinge —some of them give off a warm yellow glow while others have a bluer tint. For a strong dramatic effect, cover some larger areas with single-colored strands. Get kids involved as Christmas is a family holiday! Good to know: Christmas lights and extension cords are being offered in various amperages. Always match products of identical amp capacities.